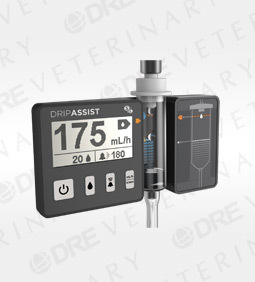 The DripAssist is a monitor and alarm for gravity IV fluid applications. It delivers at a constant infusion rate set by the clinician. 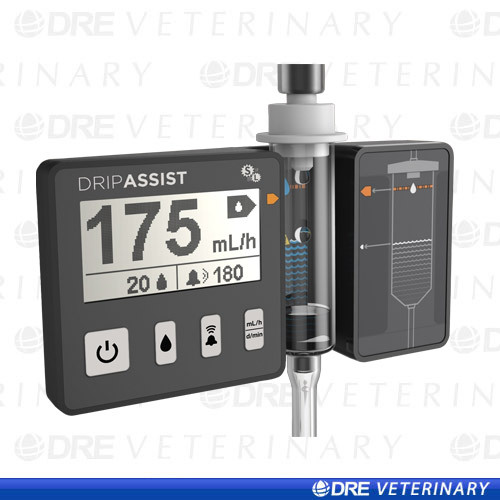 The DRIPASSIST simplifies IV fluid administration for veterinarians, providing precision measurement and monitoring without the complexity of expensive infusion pumps. This is a lower-cost, simpler solution that still maintains the ability to safely administer precision infusion. The DripAssist is designed to be placed on the drip chamber of a tubing set, and provides precision feedback on IV drip rate. When using the DripAssist, you still control the rate of flow using the roller clamp on the tubing set. The DripAssist provides visual feedback and displays values that accurately reflect the rate that you set using the manual clamp. The DripAssist does NOT control the rate of flow. The DripAssist uses optical detection to track drop intervals across all standard tubing sets for IV infusion (10, 15, 20, 60 gtt/mL). 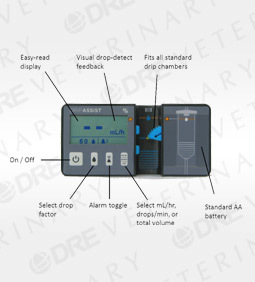 Proprietary algorithms convert irregular drip rate information into actionable information displayed on an LCD. Flow rates are calculated as mL/hr, drops/minute and total volume. Alarm functionality allows the device to remotely monitor manually established flow rates. Select the drip factor matching your drip set, 10, 15, 20 or 60 drops/ml, slide the DRIPASSIST onto the drip chamber, and observe a quantitative measurement of the drip rate that was manually set. Alarm functionality alerts you when the infusion rate changes significantly, from an occlusion, kinked line or an empty bag. Using this device reduces the possibility of human error.